The average roofing installation price for a cedar shingle roof costs anywhere between $14,000 to $25,000 depending on the slope, pitch, and size of your roof. You can expect to pay $4.50 to $9.00 per sq. foot or $450 to $900 per square installed on a standard sized single story home. Costs will vary depending on local roof contractor’s pricing. View your potential roof installation savings with local contractors below. Cedar Shingles are machine-cut and tapered for a trim, crisp appearance. Cedar Shake Roofing is hand-split, giving them a more rustic appeal. Functionally, the most important difference between cedar shakes and shingles is that shingles are milled more precisely than shakes. Cedar shakes are more irregular, and don’t lay as flat when installed. This creates gaps which can be penetrated by wind blown precipitation so professional installation is a must. If you have a traditional or historical style-home, a cedar roof will increase its aesthetic appeal, creating a more natural look that weathers to a beautiful silver-gray. Due to fire risks, cedar roofing has declined in popularity, but newer cedar shingles and cedar shakes are now treated with fire retardant, making them a safer option. Cedar shingle roofs are also a great option for high wind areas and for roofs with a steep pitch. The lifespan of your cedar shingled roof is highly variable depending on your local climate, the type of wood used, and the thickness of the cut. Generally, the thicker the cedar shingle, the longer lasting. Cedar shingles come in a variety of grades, largely based on where the wood is cut from, the center of the tree being the strongest part, and also the priciest. Beyond its unique aesthetic appeal, one of the primary benefits of a cedar shingle roof is its relatively low weight compared to other roofing materials. Compared to clay tiles or slate roofing, cedar shingles weigh very little, yet still offer adequate strength and moisture protection. This light weight allows the cedar wood shingles to be installed on standard roof framing, with no need to add extra strength and support to the structure. Cedar wood shingles cost between $2 to $3 per square foot installed, while a cedar shake roof runs between $1.75 to $3.00 per square foot. It’s important to note that this estimate doesn’t include the cost of demolishing and removing an existing roof if a roof replacement is needed. 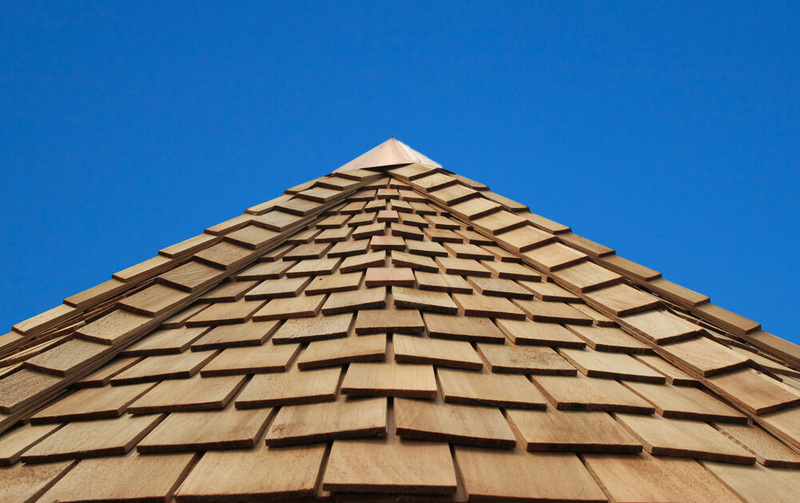 Cedar shingles are made from natural, renewable materials that are biodegradable. They offers some energy benefits, too. They help to insulate the attic, and allow the house to breathe, circulating air through the small openings under the felt rows on which cedar shingles are laid. Cedar shingles and shakes require periodic treatments with cedar roof preservatives and fungicides in order to keep the cedar roofing from drying out, warping, cracking and being attacked by mildew, insects, and fungus. Additionally, spray-on fire retardants don’t last more than a few years, so anticipate regularly recoating your roof to prevent your risk of fire. Overhanging branches will also need to be removed if they become too close to the cedar roofing in order to avoid damage from moisture and shade. Having the roof properly cleaned regularly will also give your cedar roof a longer life expectancy and aesthetic appeal. Cedar roofing need to be able to breathe in order to perform at their best, free from moisture, moss, fungi, and other damaging elements. While the traditional look of cedar is very popular, cedar shingles do require regular maintenance, can be vulnerable to fire, and even with proper maintenance only last about 20 years. If you’re worried about the lifecycle of cedar shingles, you may want to explore synthetic shingles that resemble cedar but require less maintenance, and are more weather-resistant, longer-lasting and fire resistant. If you live in California, Colorado, or Texas cedar wood roofing may be banned in your municipality due to fire concerns. There may be exceptions if they are made out of pressure treated lumber which is more fire resistant. Check with your local town or state agency.